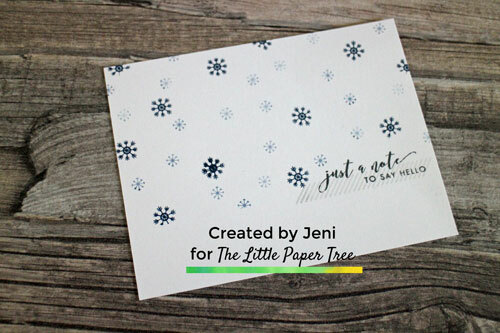 Hi, It’s Jeni with a really quick and easy card. This is a one layer card which is stamped onto a Catherine Pooler Pre-scored notecard to make it even quicker. I have a corresponding video over on YouTube. The filming off this video took just over 5 minutes. I used one stamp set and three ink colours – which you can find at the online shop. All the products I used are listed and linked at the bottom of this post. There are so many options for all year round card making in the For Everything stamp set. Lots of different sentiment options and small stamps to make everything from Christmas Cards to Valentines Cards and many more. I folded the notecard over and used some purple tape on the inside to help keep it closed and picked out my stamps and inks. I stamped the sentiment “Just A Note” and “to say hello” first in Black Jack ink straight on the bottom third of the card. I added the striped ‘washi tape’ stamp in Twilight ink. Stamping it first onto some scrap paper for 2nd generation stamping so it would be even lighter. I picked the two small snowflakes and stamped the larger one in Juniper Mist. I filled in the space with the smaller snowflake and used 2nd, 3rd and even 4th generation of ink. I used some purple tape to mask of the bottom – along the sentiment line so I could stamp half a snowflake to make this look like a cut piece of patterned paper. Do you think I added too many snowflakes? Is my pattern random? And that’s it. This clean and simple card is finished. This would be a great design to use to make a quick gift set of cards as a Christmas or birthday present. The video is below – watch it here on the blog or over on YouTube. Don’t forget to leave a comment, give the video a Thumbs Up and subscribe to our channel so you don’t miss any future video tutorials. I’d love to see you at our Facebook Group too. The Little Paper Tree House Tribe is a fun and friendly place to share your makes, tips and ask any questions.